Living… in a dystopian future in which nuclear war has left most of the world an irradiated wasteland. The United States has been reduced to desert and cursed earth – and within its poisoned borders there is a cursed city: Mega-City One. Stretching from Boston to Washington D.C., it is an unbroken concrete landscape, where 800 million people live on top of each other in sprawling mega-structures. Profession… judge, although in Dredd’s world the job is a little different from what we’re used to. Within the bloody and unpredictable confines of Mega-City One, there is “only one thing fighting for order in the chaos. The men and women of the hall of justice.” Known as “judges,” they operate as judge, jury, and executioner, dispensing frontier style justice as they see fit. Dredd is perhaps the greatest of the judges: lethal, principled, and immune to corruption. Interests… justice, justice, and justice. Judge Dredd has no life outside of policing Mega-City One. He maintains no close friendships, and cultivates no hobbies. Instead, he spends every waking moment of his life chasing down criminals, and trying to keep the sprawling metropolis from “breaking under its own weight." Relationship status… single. The Hall of Justice mandates celibacy for its judges. Challenge… saving Mega-City One from a drug epidemic. Recently, a new highly addictive drug that causes users to experience time at 1% its usual speed has begun filtering down to the streets, where it has earned the name “Slo-Mo.” When the chief manufacturer of Slo-Mo, the ruthless Ma-Ma, has three men skinned, drugged with Slo-Mo, and thrown off a 200 story building, she draws the attention of Judge Dredd. 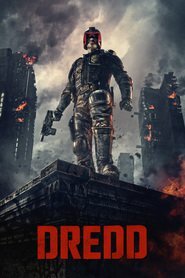 Accompanied by his rookie-partner Cassandra Anderson, Judge Dredd heads into the criminal mega-complex of “Peach Trees,” intent on getting to the bottom of the murders and eradicating Slo-Mo from Mega-City One. Personality… fearless, dedicated, and completely humorless. Judge Dredd is less a man and more a manifestation of justice. He adheres to the letter of the law in a city that witnesses 17,000 serious crimes a day. It’s a difficult task that constantly tests his dedication. While Dredd is 100% committed to his work, it would be wrong to say he enjoys it. Pleasure never enters into the equation for him – it’s simply that his immutable principles demand that justice be served. Dredd's popularity ranking on CharacTour is #565 out of 5,000+ characters. See our top-ranked characters and read their profiles.